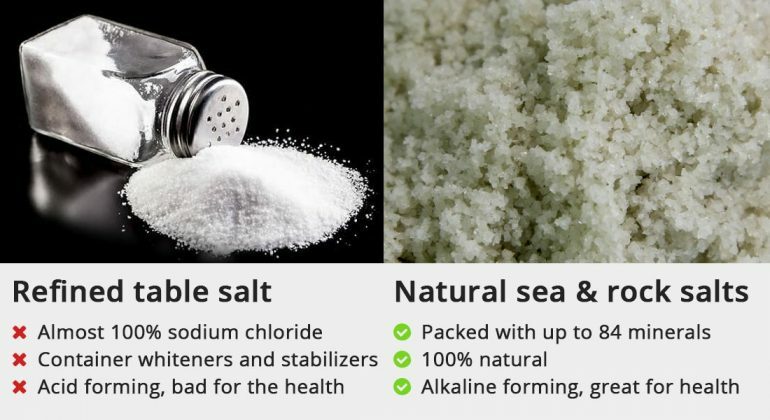 We all know that refined table salt is bad for our health: it is over 99% sodium chloride, bleached and contains harmful additives such as stabilizers, making it essentially toxic. Have you considered that there are healthier alternative salts to sodium chloride (table salt)? Natural salts are unrefined, 100% natural sea and rock salts, packed with minerals and trace elements that actually support the human body and are essential for our health. I will show you how they are produced, explain why they are healthy and the nutritional value of each salt. Why Use Naturally Extracted Salts? Naturally extracted salts are lower in sodium so you end up reducing sodium in the diet. Naturally-occurring salts are packed with minerals such as calcium, iron, magnesium, potassium, and zinc essential for our health. In fact, the human body contains a similar mixture of mineral salts to the primordial seas. No manufacturing company can create a substance that matches the health benefits of natural salt. Many naturally extracted salts contain trace elements—minerals required for normal healthy growth. Natural salts do not contain additives such as bleach, whiteners and stabilizers. Refined salt is acid-forming, whereas natural salts are alkaline-forming, and so will help balance body pH and prevent illness and disease. Natural salt is essential for ATP production, which gives us our energy. The healthy alternative salts are even tastier. Here is a complete list of naturally occurring healthy alternative salts. I have included salts from all over the world so no excuses folks! Say goodbye to refined table salt and start using these in your cooking today! Upstream, Australia’s Murray River flows over mineral rich rocks. Some of the minerals dissolve into the water. Salt is produced using the pristine mineralized brine from the ancient saline aquifers of the Murray Darling Basin. Mineralized brine is pumped into shallow lake beds and the sun does its work over many months, leaving a layer of high quality, mineral-rich salt free of additives and preservatives. The resulting salt flakes are soft and fragile. Murray river salt is 97.8% Sodium Chloride, 0.8% Magnesium, 0.3% Potassium, 0.15% Calcium and 0,00005% Iodine. 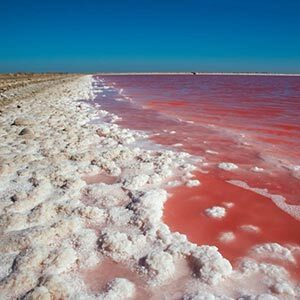 In a process that can take up to two years, Mediterranean sea water is channeled into shallow ponds and lagoons called salins, and allowed to dry naturally in the sun. Cyprus Flake Salt is mild flavored with uncommonly large, hollow pyramid-shaped crystals that make it light and fluffy in texture. 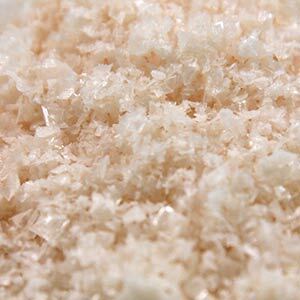 As with all sea salts, Cyprus Flake is rich in minerals like sodium, chloride, potassium, calcium, magnesium, copper and zinc. Black Lava salt is naturally-occurring, derived from Cyprus Flake Sea Salt but with activated charcoal. This means that it is especially beneficial for removing poisons from the body. 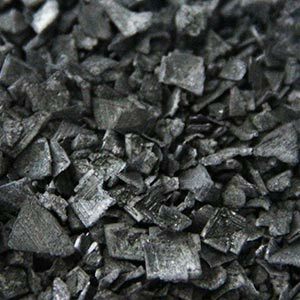 Charcoal works by binding with toxins and harmful elements in the body and escorting them out for elimination. 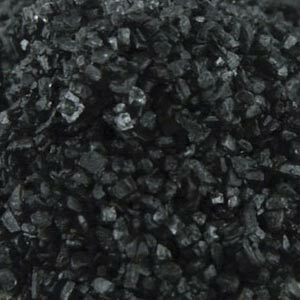 As well as the usual minerals of traditional sea salt, Black Lava salt is also rich in carbon. The Guérande salt marshes are located in France’s Atlantic coast, between the mouths of the Loire and Vilaine rivers. Salt is collected daily at low tide in 3 types of clay pond and allowed to dry in the sun—as per traditional 9th Century harvesting methods. Like most unrefined sea salt, it has a light grey hue and moist to the touch. 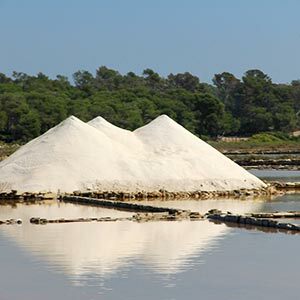 As well as the usual minerals of traditional sea salt, Guérande salt is particularly rich in Magnesium and Potassium from the clay used in the drying process. Camargue salt is considered by chefs to be the finest in the world. Salt water is pumped into natural salt flats in march and allowed to dry in the sun over summer. The concentrated brine can grow to 20 cm thick, 9 cm of which is harvested as sea salt. The top of the cake takes on a bright red hue due to the presence of a special kind of algae that turns brighter as the salt concentration increases. Like most unrefined sea salt, it has a light grey hue and moist to touch. Camargue salt is particularly high in natural sodium, and rich in chloride, potassium, calcium, magnesium, copper and zinc. This high sodium content is organic and beneficial, different from table salt that has only two processed minerals: sodium and chloride. Also known as Himalayan black salt, Kala Namak is a rock salt widely used in South Asian cooking. It is prized in Ayurvedic Medicine where it is considered a cooling spice with laxative and digestive properties. 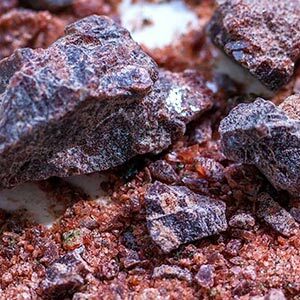 Although it is named “black salt”, it is really brown-violet in color and has a pungent smell due to the sulfur content. 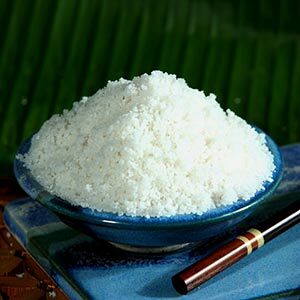 Kala Namak salt contains sodium, sulfates, sulfides, iron and magnesium. Sun dried in salt flats near Camillone, Italy, is a high quality, natural sea salt processed by hand using traditional methods with no artificial additives. Camillone sea salt is 95% sodium chloride, 0.65% sulfates, 0.3% magnesium, 0.2% calcium, 0.001% iron with trace amounts of copper, iodine and zinc. New Zealand sea salt is harvested from the deep, pure waters of the Southern Pacific that channel through the Cook Strait. The salt is placed on the rocks using only the sun and wind to remove the water. The resultant salt is natural, certified organic and unprocessed with no additives. As with all sea salts, New Zealand organic salt is rich in minerals like sodium, chloride, potassium, calcium, magnesium, copper and zinc. 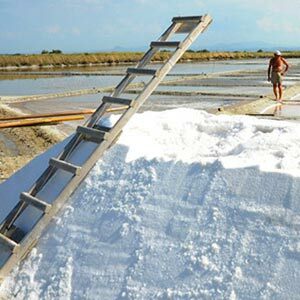 Trapani Sea Salt is handcrafted from salt pans along the famous Sicilian “Salt Road” in Italy. The salt is sun dried and collected by hand as per traditional methods. Unrefined and all natural with zero additives. Trapani Sea salt contains sodium chloride, sulfates, calcium, magnesium, potassium, iron and trace elements such as strontium, manganese, iodine, zinc, fluorine, silver, boron, and copper. On Aguni Island, the waters of the Pacific ocean water repeatedly run down bamboo to facilitate the evaporation process. The resultant mix is left to dry in the sun until a raw, premium salt is obtained. As with all sea salts, Aguni no Shio salt is rich in minerals like sodium , chloride, potassium, calcium, magnesium, copper and zinc. Produced by natural methods in the lagoons of Cuyutlan, Flor de Sal is prized in Mexico. Salt is dried out in salt flats and carefully harvested so that it retains its beneficial qualities. According to Nayarit University, the low sodium content in Flor de Sel can improve the quality of life for diabetics, people with heart problems and high blood pressure. 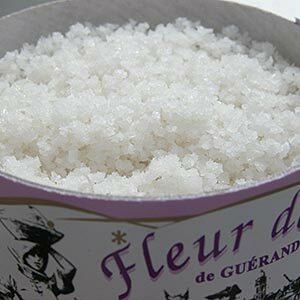 Flor de Sal is a sea salt prized for its low sodium content and contains 84 trace elements. 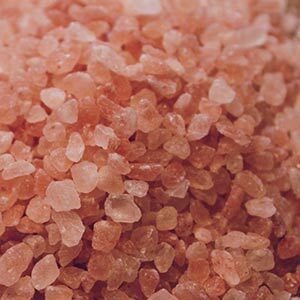 Instantly recognizable pink, and probably the most famous on this list, Himalayan pink salt is a rock salt from the Kewra mines in Pakistan. It was many million years ago—meaning that it is completely free from the contaminants and pollutants of modern life. The crystals vary in color from white through to dark red, depending on the extraction point and contain 84 different elements, many vital to our body. Himalayan salt contains 95–98% sodium chloride, 2–4% polyhalite (potassium, calcium, magnesium, sulfur, oxygen, hydrogen), 0.01% fluoride, 0.01% iodine, and micro-amounts of numerous trace minerals. Of course, there is the popular Epsom salt, made famous for its high magnesium content. Epsom salt was discovered in the waters of a bitter saline spring that was rich in magnesium sulfate. The spring water was said to have purgative powers and seemed to be healing for many minor ailments. In late 1600s, the salt was patented for exclusive manufacturing to be sold over the counter. The key mineral in Epsom salt is magnesium. It is also rich in calcium and sulphur. 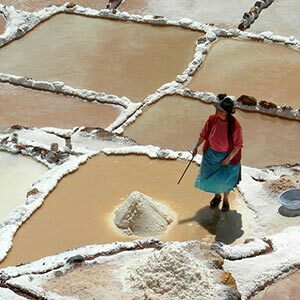 High in the Andes, at an altitude of 3000 meters, and a long way from the Pacific Ocean, Pink Maras salt is produced in spectacular, terraced, man-made salt ponds that predate the Incas by several centuries. Millions of years ago, the movement of tectonic plates pushed the seabed up to form the Andes. Sea salt was locked into the rocks and filters out through the Qoripujio spring. Antarctic Pure Sea Salt is created when the Antarctic waters are carried up the west coast of Africa by the Benguela current. This ice-cold water passes through an underground aquifer and is then pumped into drying pans. The intense African sun and Atlantic winds help to sun and wind-dry the salt. Every few days the salt is hand-harvested with special scoops to retain its perfect crystal formation. 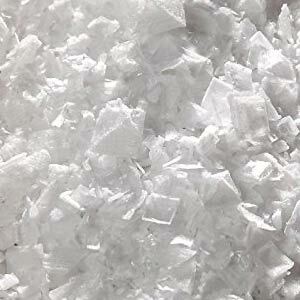 Antarctic salt is rich in minerals like sodium, chloride, potassium, calcium, magnesium, copper and zinc. The salt is then gently heated in a vacuum at very low temperature to aid evaporation. The salt is harvested by hand and certified organic. As with all sea salts, Halen Môn organic salt is rich in minerals like sodium, chloride, potassium, calcium, magnesium, copper and zinc. The salt is processed by sun-drying the waters from the Pacific and then mixed with purified volcanic lava and vegetable charcoal, giving it the black color that it is. Black lava salt is beneficial for the digestive tract; can be used to relieve stomach burn and trapped intestinal air; and aid toxin elimination. 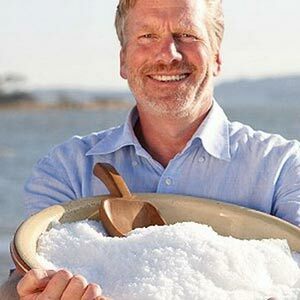 Harvested just under the Arctic Circle on the small island of Sikta, Alaska, Pure sea salt is a natural, hand-produced salt popular among North American chefs. Do natural salts contain contaminants? Yes and no. For example sea salts taken from polluted seas can be contaminated. However, such a product would not make supermarket shelves. Sea sea salt is collected from pristine sea waters and often filtered. Rock salts such as Himalayan salt formed millions of years ago, long before modern pollutants! Why are natural salts slightly grey? Refined salt has most of its mineral content removed, and is bleached to make it white. Natural sea salts retained their healthy mineral contents and do not get bleached so have an off-white appearance. Why is my sea salt clumpy and damp? 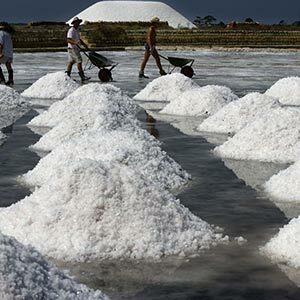 Rather than heating to high temperatures (which destroys many minerals) naturally-extracted sea salts are dried in the sun and wind, which retain some of the original moisture (they usually have a 2% – 5% humidity). They are also 100% natural and free of additives such as stabilizers and anti-caking agents, giving it the clumpy appearance. Why are naturally-extracted salts more expensive? Naturally-extracted sea and rock salts go through a slow and careful process of extraction to maintain all of the valuable minerals. They are often hand-collected which takes time, adding to the cost. Table salt is mass produced or even manufactured in a lab, making it much cheaper to produce. By paying a few dollars more, you get an extremely healthy, energy-boosting, disease-fighting natural salt. In fact, you need less natural salt for flavoring than when you use regular table salt. Which is best? Rock salt or sea salt? Rock salts are generally considered the more mineral rich and purest as they were laid down millions of years ago, before events like the industrial revolution and manufacturing of toxic chemicals. However, both rock salt and sea salt are excellent healthy alternatives to refined salt. I’ve been using Himalayan Salt for quite a long time now and I have observed great health benefits myself. Like these salt benefits, I have also been using Himalayan Salt Lamps and I love them. They make the surroundings calm and peaceful when glows up. On heating, they release negative ions and neutralize the effect of positive ions (which sound positive but are not healthy for our body) which are released by our daily electronic appliances such as mobile phones, televisions, laptops etc. They help a great deal to those who are suffering from depression, anxiety, insomnia or any other disturbing problem. I love them!